Tennis fans around the world admire today’s champions for their spectacular athleticism and talent. As much as we admire the talent behind Federer, Nadal and Djokovic’s game, the legends behind the 1990’s transition to modern tennis is still in the minds of many old timers. Any tennis player that has admired the game for some time will remember the remarkable rivalry between Andre Agassi (Player Profile) and Pete Sampras (Player Profile) behind the US Open lights under the Arthur Ashe stadium. Although these two players have faced off in other venues, their 2002 US Open showdown was most memorable. Most of the matches played between Agassi and Sampras took place in the 1990’s, with Sampras’s lifetime record leading 20-14 against Agassi. Their first meet up occurred in 1989 in Rome, with Agassi winning easily in straight sets 6-2, 6-1 at the round of 32. This marked the beginning of a decade long rivalry between the two Grand Slam contestants. Little did the tennis world know, the game would be forever changed by the grace, elegance and fluidity that these two players brought to the tennis court. Perhaps the biggest factor in creating the Agassi and Sampras rivalry and the excitement that came along with it was due to each player’s unique and contrasting style. Pete Sampras was known for his adept serve and volley game, whilst Agassi was better known for his crushing baseline groundstrokes. Pete Sampras had one of the best serve motions on the entire ATP Tour in my opinion, and he often followed it up with exquisite volleys at the earliest opportunity. 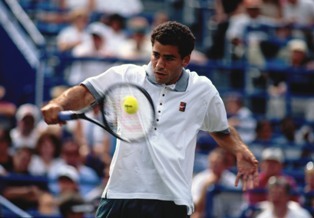 Agassi depended on his solid and powerful ground game to neutralize Sampras’s advantage at net. Their contrasting game style and court positioning alone made it incredibly exciting to watch for most tennis fans around the world. In addition, the hard court surfaces at the US Open in the 1990’s was much faster during their rivalry. These faster paced courts forced both players to react faster to shots. The same shots that seem to spin slowly on today’s courts, rapidly descended at each player’s side of the baseline much faster than what is seen in today’s US Open hard court surfaces. 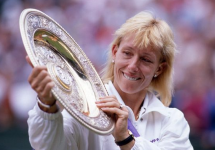 The 1990’s was a real treat for tennis fans in that the pro tour consisted of classical tennis combined with modern tennis stars. The serve and volley variety seen amongst the tour coupled with the up and coming power baseline game of modern tennis created a unique style of match up that was never seen before. Their first major Grand Slam battle occurred in the finals of the 1990 US Open championship, with Sampras taking the trophy in 3 sets 6-4, 6-3, 6-2. As epic as that match was, this was only the beginning of many more battles to come. The year 1995 was another fantastic year marked by Sampras and Agassi’s dominance in tennis. With Brad Gilbert on board with Agassi as his fulltime coach, this fostered an incredibly powerful coach and player dynamic. In 1995, Agassi and Sampras met up a total of 5 times, all of which were in finals of pro tournaments. In 1995, Agassi defeated Sampras in the finals of the US Open, the ATP Masters Series Canada, ATP Masters in Miami and in the Australian Open. In this year alone, Agassi led 3-2 in wins against Sampras. I believe Agassi’s remarkable performance in 1995 was partially due to the new inspiration that Brad Gilbert brought to Agassi’s game. Tennis is a unique game in that small adjustments at the pro level can equal big differences to a player’s results on the pro tour. Nonetheless, the tennis world was still in for more epic matches in the following years to come. Beginning in 1996, Sampras’s game began to dominate. I believe that the previous years of experience on the pro tour allowed Sampras’s game to fully mature and develop. 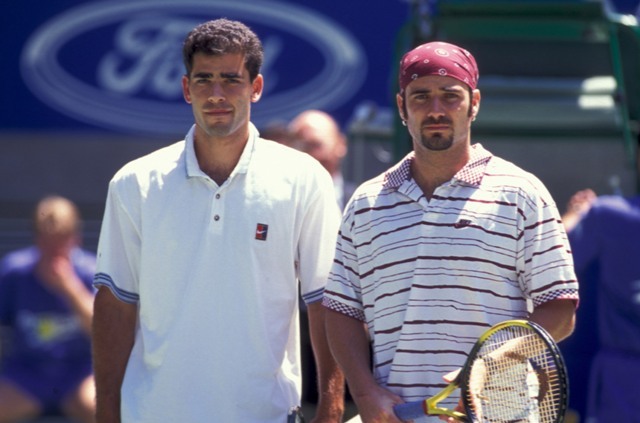 Between 1996 and 2000 alone, Sampras and Andre Agassi met up 12 times on the ATP Tour. In this time period, Sampras won 8 matches out of their 12 match ups, which clearly expressed Sampras’s dominance during the latter half of the 1990’s. The year 1996 was the beginning of a shift in dominance. Sampras’s game began to fully mature, while Agassi’s game could not quite keep up with Sampras’s. 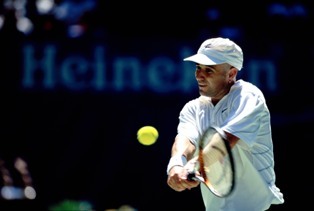 Still, with Brad Gilbert under his wing, Agassi made it to the finals of the 1999 Wimbledon championships only to be defeated again by Sampras in 3 sets. Perhaps the most epic match of all was their final battle which took place in the finals of the US Open in 2002. The New York atmosphere on that sunny summer day was the perfect setting for an incredible final match to come. This match alone had many tennis fans on the edge of their seats in anticipation. On that day, Sampras’s serve and volley game was working to a tee. Even with Agassi’s powerful groundstrokes and strategic passing shots, he could not fend off the multiple Grand Slam champion. It appeared as if Sampras had the net covered from every angle, and nothing could stop him. The battle lasted an incredible 4 sets that was closely contested by both players. 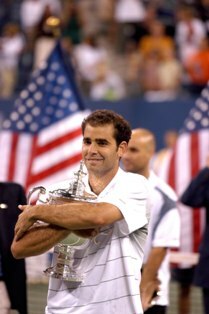 The final score was 6-3, 6-4, 5-7, 6-4 with Sampras taking home the US Open trophy. This match marked their last and final battle and a decade long fight for the top ring at the highest levels of tennis. Words could not describe the elegance of Sampras’s shots on that final day. Even today, that match is still in the minds of many tennis fans. Both players are now retired, but their legacy and Grand Slam memories will live on forever in the minds of tennis fans worldwide. As we watch today’s champions such as Federer, Nadal, Djokovic and Ferrer we can only begin to grasp and appreciate the contributions that Agassi and Sampras delivered to the world of tennis. 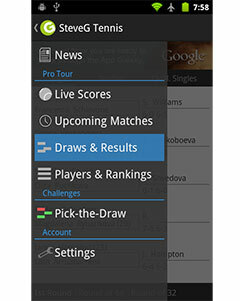 Optimum Tennis - Stroke analysis, enabling you to play like the pros.